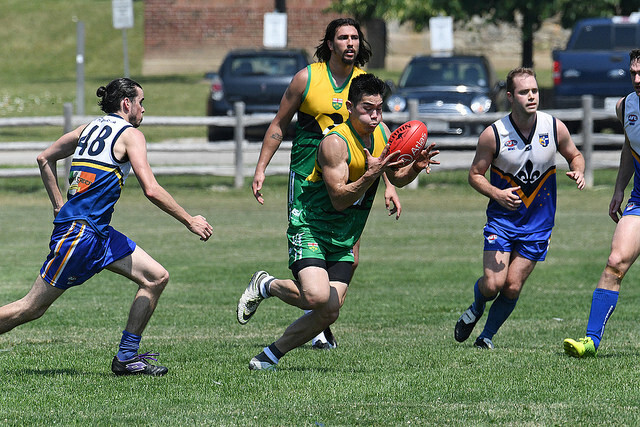 AFL Canada has been looking to increase it's international competitiveness by increasing the number of representative fixtures and the Canadian Nationals are the latest step up from the inter-provincial games held prior to the 2017 International Cup. AFL Canada has also taken development teams to England as earlier preparation. This hasn't gone unnoticed south of the border where the USAFL is taking a team to Ireland this year and has been holding annual national tournaments. The following report on the Canadian Nationals is from Zachery Brandstater, Président of AFL Québec. WFN thanks Zachery for his effort in producing this report. The Canadian Nationals tournament is an opportunity for the various entities within AFL Canada to get together and play some high quality football. AFL Canada restricts eligibility for this tournament to only those who would be eligible for the Canadian national team. As it stands British Columbia, Alberta, Ontario and Québec all support leagues in their own right so there is plenty of football across the country (over 5000 participants in 2017, including youth football programs). This network of grass roots football is contributing to a strong football identity in Canada, and it is continuing to gain momentum. The last Nationals tournament was held in Vancouver in 2016 (last year was skipped sure to the International Cup). This year it was held in Toronto. Ontario and Québec had full teams in both the men's and women's competitions. BC and Alberta combined to field their teams as the distance proved a little tricky on Canada Day weekend for some. Nova Scotia and Winnipeg, both relatively small compared to the other jurisdictions, also put in a joint team for the men's competition. Ontario was clearly the strongest team over the weekend, particularly in the women's. Québec managed to beat out BC/Alberta after losing to Ontario in the first game of the weekend. However, Ontario were a classy outfit and walked away with the in the final. In the men's Québec gave Ontario some trouble during the round robin but couldn't get over the line. We won our two other games to finish second and earn a rematch against the green and gold. While there was less than a kick in it at half time we lost confidence after a couple of quick goals early in the second half, which proved to be the difference in the end. The BC/Alberta team were not a long way behind Québec, and given their limited playing time together this was a testament to their skills and the coaching group. The Nova Scotia/Winnipeg team played with great heart but couldn't overcome their more experienced opponents. The weather was a big factor for all involved over the weekend. With the thermometer at 35 and the humidex reading 45+ there was a big emphasis on player welfare. Thankfully everyone came away ok thanks to the abundant shade and good planning by team managers. Footy is played in the summer here as during the winter, especially in the eastern regions, winter is not conducive to playing outdoor sports. EThereLive were on hand on the Sunday to stream matches throughout the day. The content was watched avidly by some members of AFL Québec who couldn't make it (and at least one cat). Players from various teams took turns providing the play by play commentary throughout the day. From AFL Québec's perspective it was a very successful weekend. Both of our teams were very competitive and we had a good time to boot. We have a number of young players who made their bid for inclusion in the national squad and our coaches (Chris Shee and Luke Anderson) learned a lot which can be applied to our US Nationals trip later this year. The live stream, which is now available on YouTube, will be particularly helpful for us going forward. At an individual level there were many outstanding performances, but special mention of three players in particular is warranted: Roxanne Besner was runner up MVP of the tournament for the women and for the men Ronan Shaughnessy and Kyle Graham, both AFL Québec veterans, took out first and second place respectively. Overall it was a good tournament and we are thankful to AFL Canada for organising and to AFL Ontario for hosting.